that was going to a tradeshow and they needed illuminated signs that they could put up easily for the tradeshow and be able to transport to different locations. 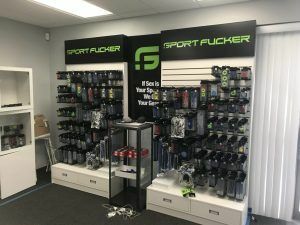 As you can see from the photos, we made two illuminated signs for either side of the display, and a digital print with the company tagline for the middle section. When you are at a tradeshow, you want to make sure that you stand out because there are many other companies there that can be offering the same thing that your business offers. Illuminated signs are a great way to catch the attention of people passing by and a great way to stand out from the competition. Tradeshows are a great way to gain new clients or sellers and signage is the best way to display your company logo and attract people to your booth to learn more about your products. The illuminated signs we made are channel letter cabinet signs. A channel letter is typically a fabricated metal letter and a front-lit channel letter has metal sides and back with a translucent face so the face lights up. This sign is made just like a front-lit channel letter but it’s just in the shape of a rectangle. The green portion is a digital print based on their company logo color, and the black portion is black car wrap vinyl so the light only shines through the green portion. The middle section is just a digital print on vinyl that we laminated and mounted onto gator board. Gatorboard is lightweight and pretty inexpensive so it is a great choice for tradeshows.